If walls could talk, some of them would tell you about artists Chris Arnold and Jeff Garrison. After graduating from Booker T. Washington High School for the Performing and Visual Arts, Chris Arnold set out for Ohio to attend the Columbus College of Art and Design. Armed with his sketch pads, straight jeans, and jazz CDs, the preppy kid was eager to meet his new roommate. Then he saw Jeff Garrison, a long-haired hippie wearing bell bottoms and a rock concert t-shirt. Twenty-six years later, Arnold now has the long hair, and Garrison hardly has any (except on his chin). And, as it happens, it did work. After graduation, they moved to Dallas and formed Eyecon, a company whose large-scale murals you’ve likely seen on buildings around town. Their studio in Oak Cliff displays almost two decades of projects. Models and photos of projects line the walls, papers with sketches clutter the shelves, and splattered paint is everywhere. Their projects over the years have included things as minute as painting ivy on bathroom walls to creating grandiose scenes in McMansion theaters and iconic murals on parking garages. 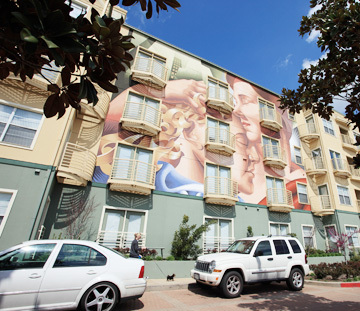 Mass Transit was Eyecon’s first big mural. 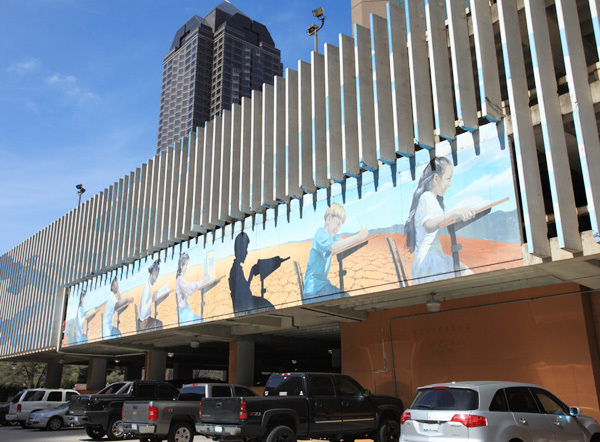 the downtown improvement district Committee held a competition for artists to paint a mural on the Renaissance Tower parking garage. The piece could be anything, but it had to illustrate the tag line “Transportation.” The committee looked everywhere for talent­—except in Dallas. Then one of the board members, who happened to be the arts coordinator at Booker T. Washington, spoke up and said, “I know a guy.” She contacted Arnold. Eyecon applied to the competition and won. 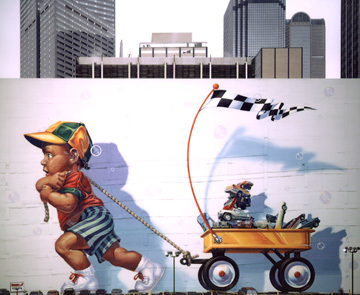 Today, the mural, which portrays a 100-foot-tall toddler and cars that are larger than life-size, is mostly covered up. Garrison misses the obscured work. The Storm was the result of another competition through the Downtown Improvement District that Eyecon won. The piece portrays about 40 local artists trying to make it in the industry. 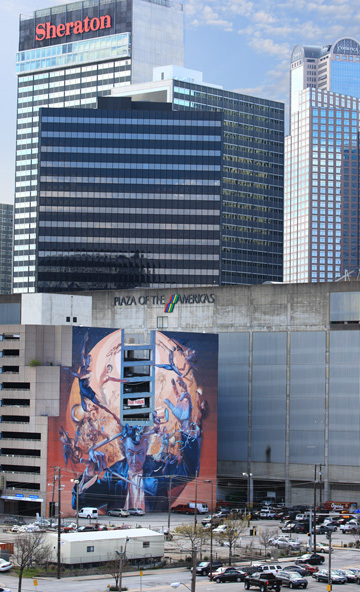 The mural overlooks Dallas’ Arts District (walk down the staircase at the Winspear Opera House, and you’ll get a straight shot of the piece). In 1995, Garrison and Arnold were working with Kathryn and Craig Hall on a piece. Although that piece never came to fruition, another one did. A garage on the footprint of the Cotton Exchange had a rather ugly facade. So the Halls asked Eyecon to do something about it. The artists answered with Resources. After the old Dr Pepper headquarters was torn down on the corner of Mockingbird Lane and Greenville Avenue, there was an outcry in the architecture community. The building was a great example of art deco, and people wanted to ensure that the character remained. So the deed for the land indicated the new properties had to contain some element of art deco. One architect had an idea. Phoenix Midtown, an apartment complex that had been built on the corner, was falling apart. It had to be fixed. So architect Paul Chapel proposed using Eyecon to paint giant art deco scenes on the exterior of the building. Arnold couldn’t have been happier. His dream was to do art deco on a large scale. The result is seven images depicting urban life and an architectural frieze wrapping around the building. But the artists needed models for these images. Some were easy. The image titled Embrace is Arnold and his wife, Kim. And other models, like the one used for the businessman, literally showed up on Eyecon’s doorstep.